In the first two months of the current fiscal year that began on October 1st, the US national debt has grown $320 billion. That is $21 billion more than the same 2-month period last year, which illustrates that the growth of the national debt continues to accelerate. 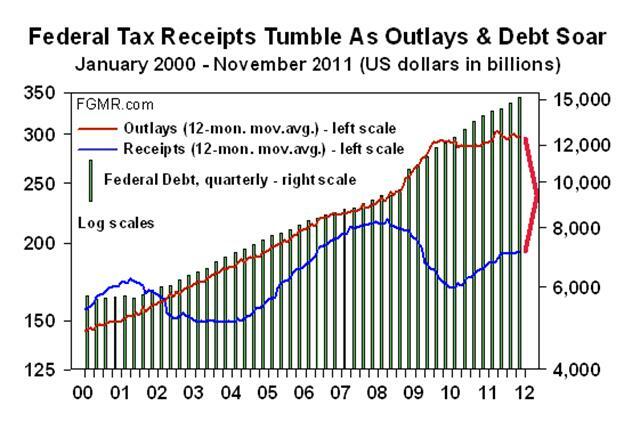 The reason of course is the federal government’s huge operating deficit, which is not getting any smaller. This point is illustrated in the following chart. Hyperinflation is always the outcome of unchecked government spending. The spending leads to ever greater deficits, which requires the government to borrow ever greater amounts of money. Eventually a point is reached when the government needs to borrow more money than lenders have the capacity – or willingness – to lend. Thereafter the government can take either of two alternative paths. Either the government cuts back its spending, facing the reality that it has run out of money. Or the central bank steps in to create ‘out of thin air’ the money the government wants to spend. This second alternative inevitably leads to hyperinflation. A government’s decision to take the hyperinflationary alternative is what I call the “Havenstein moment”, with the dubious distinction going to the ill-fated governor of the Reichsbank whose decisions lead to the massive hyperinflation that destroyed the economy and devastated the middle class of 1920s Germany. The US government has long passed its Havenstein moment. With so-called “quantitative easing”, which is the modern term for money printing, the Federal Reserve is enabling the federal government to take the soft political option. Spending has not been cutback, despite the perennial shortfall of government revenue. This uncontrolled spending has been accommodated by money printing, which today means expanding bank balance sheets. In this regard, the United States is different from Weimar Germany, which was a cash-currency economy with nearly all commerce conducted with paper banknotes. In contrast, economic activity in the US is substantially conducted with bank deposits, circulated by check, wire transfer, plastic card, and the like. So ‘money printing’ today is accomplished by expanding bank balance sheets to create more deposit-currency. In the past year, commercial bank balance sheets have grown $611 billion. In addition, the Federal Reserve’s balance sheet has expanded $516 billion, or 21.6%. This money printing is starting to have its inevitable effect. Over the past six months, M1 is up 22.8%, while M2 has expanded 14.0%. Inflation for the past year as calculated by ShadowStats.com is 11.0%. As further proof that the Havenstein moment is behind us, consider that 58% of the money spent by the federal government in October and November came from borrowed money ($320 billion of debt against $551 billion of expenditures). Monetary history shows that governments are on a hyperinflationary path when crossing the 40% threshold, a level long passed by the federal government. The above chart makes clear that the US government does not face a cyclical problem, which can be overcome by robust economic activity that would bolster federal revenue. Rather, it faces a structural problem, or in other words, the system is broken. Decades of spending, consumption and debt have taken their toll. To put it bluntly, the US federal government is broke. But the government and the Federal Reserve refuse to admit this reality. So having long passed the Havenstein moment, the erosion of the dollar’s purchasing power is the inevitable outcome. This debasement of the dollar will become increasingly clear in 2012. As a consequence, it is logical to expect much higher prices for gold and silver in the year ahead.